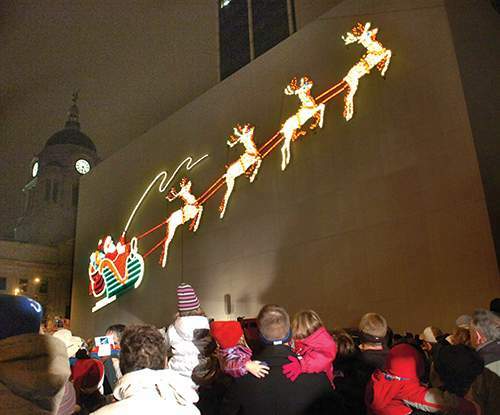 File Santa and his reindeer will again light the way for the city's holiday, beginning at 6:20 p.m. today. If you are planning to attend the Night of Lights, tonight's traditional start of Fort Wayne's holiday season, your thoughts may already be turning to the past. The downtown Thanksgiving Eve celebration has become a cherished tradition for thousands of families, and displays that have shone for decades will draw them back tonight. Santa and his reindeer graced the Wolf & Dessauer department store in the 1940s and 1950s. Generations of children have beheld the magical sleigh since it resumed its holiday-season journey on the PNC Bank Building in 1980. Some of those children will return tonight with their own kids and grandkids. 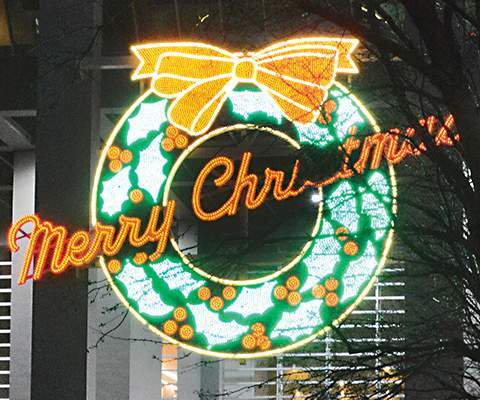 The Merry Christmas wreath and the other displays that have emerged in the decades since are adding new layers of nostalgia. Last year, the Ash Brokerage Building joined the lighting schedule. Could other new developments be far behind? Within a few seasons, the riverfront project will surely add to the holiday glow. Just this week, the Fort Wayne Plan Commission gave the go-ahead for a big piece of the project, a large apartment/retail/parking complex planned for Superior Street. Imagine how, one season soon, displays at The Landing and Electric Works may add to the holiday tableau. In recent days the City Council forged a compromise over how expenditures for streetwork near The Landing would be reimbursed. After a long summer of negotiations over public investment in the ambitious renovation of the GE campus, big-name investors are stepping forward. This week, Medical Informatics Engineering became the fourth entity to announce its intention to develop facilities at Electric Works. Christmas Past is a beautiful memory. But imagine what Holidays Yet to Come could mean for Fort Wayne.